Junk bonds, which are also called high yield debt, are not a new concept in the world of investments. They have actually been around for decades. But, with interest rates on savings accounts and money market funds in the doldrums, investors are once again looking for higher rates of return, and junk bonds are all the rage again. But, what are junk bonds? 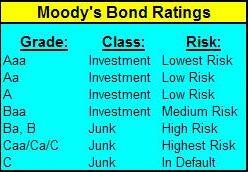 Junk bonds are a high risk bond that are not investment grade. They are a speculative bond issued by a company with a credit rating of Ba or lower by a rating agency including Fitch, Moody’s, A.M. Best, or Standard & Poor’s. Each rating company has a slightly different scale. A lot of times junk bonds are issued for leveraged buyouts and other takeovers by companies with questionable credit that cannot secure other traditional bank financing. The debt of 95% of U.S. companies with revenues over $35 million is rated non-investment grade or junk bonds. Today, junk bond issuers include such big corporate names as U.S. Steel, Delta, and Dole Foods. Junk bonds have a low credit rating and give the investor a higher yield than safer investments such as U.S. Government Treasuries. For those investors who are familiar with the investment-grade bonds that companies issue to fund their day to day operations and expenses, junk bonds are just the opposite of that. In layman’s terms, junk bonds have a high risk of default and give a higher yield than better quality bonds in order to make them more attractive to customers…hence the name “junk”. Also known as the speculative grade bonds, junk bonds have soared in popularity in recent years with investors who are in search of a higher rate of return. When you are buying a bond, you are lending money to the institute or government that you are buying it from. The amount you will be getting back or even the chances of you getting it back in the first place depends primarily on the ability of the firm you lent the money to in the first place. A junk bond is actually exactly the same as a regular bond issued by a company. Junk bonds are a loan for a corporation or organization that agrees to pay you back your principal investment on a certain date in the future (often as far down the road as 30 years), and at a certain interest rate. There are risks associated with investing in junk bonds of course. The reason that their rate of return is higher than a government bond or savings account is that there is a real risk of default. The lower the rating, the less the chances of you getting it back. Junk bonds are usually issued by those companies that have a questionable ability to meet their debt obligations. Junk bonds are not an investment for everyone. There are many other investments that investors should tackle first such as earning your company’s match to your 401-k plan, maxing out your Roth IRAs, and investing in good growth mutual funds. But, of course, if you are looking for a few extra percentage points on your investments, maybe you should consider peer-to-peer lending through a company such as Lending Club or Prosper. I have been able to earn an average of 15% annually over the past year.